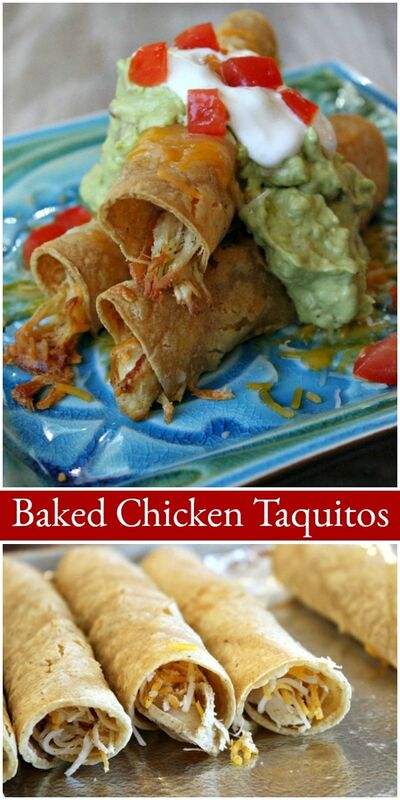 These Baked Chicken Taquitos are a super easy, family friendly dinner recipe. They’re simply corn tortillas that have been stuffed with chicken, cheese and a few spices, and they’re baked until crispy. Watch the video showing you how to make these, then scroll to the bottom of this post and print out the recipe so you can make them at home. Most of the world calls these “taquitos,” but in San Diego, these are affectionately called, “Three Rolled Tacos with Guacamole.” We have a zillion of these little Mexican fast food shacks around town- and the ever popular favorite thing to order is the rolled tacos with guac. They’re deep fried and probably rather evil to consume, but this is a healthier, baked version of taquitos. 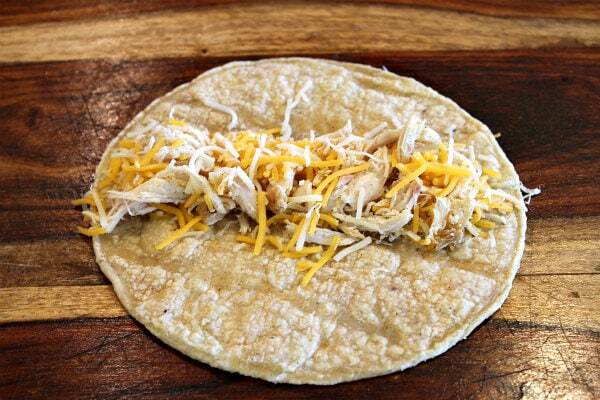 Corn tortillas are lightly stuffed with spiced-up, shredded chicken and cheese, and then they’re rolled up tightly. Placed on a baking sheet seam-side-down, they are lightly sprayed with cooking spray and then baked for 25 minutes. That’s it! While they’re baking, you can whip up a quick guacamole (see recipe for details). , but since my son is obsessed with my guacamole, I had to go with that. 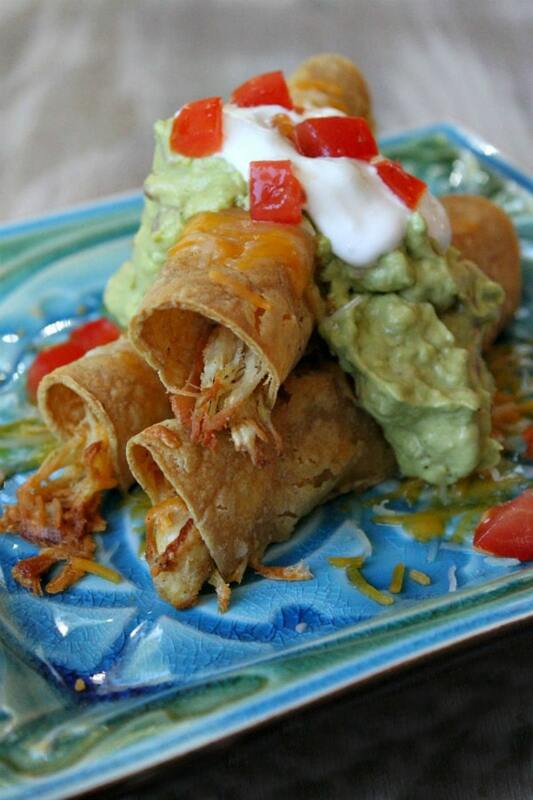 Perfectly crispy out of the oven, the San Diego way to serve them is to melt a little more shredded cheese on top and add a big dollop of guacamole and sour cream. You can serve them however you’d like, of course. Even if you just want a little dunker of salsa instead of the guacamole deal, that works too. This recipe comes from my friend Catherine McCord’s (Weelicious.com) first cookbook: Weelicious- One Family. One Meal. 140 Fast, Fresh and Easy Recipes. It’s a fabulous, must-have book for families who have kids… picky kids… kids who like food… kids who are tough to please… any kids… and parents who need to FEED those kids! 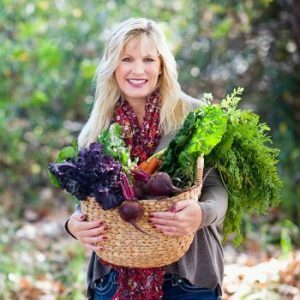 Weelicious offers recipes for fresh, healthy, appealing meals for young kids. 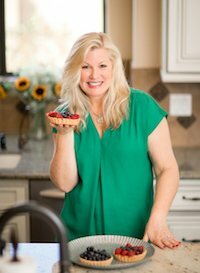 Author Catherine McCord teaches parents how to turn their kids into great eaters who appreciate food and are open to exciting new flavors. I love that Catherine focuses on getting kids involved in the kitchen from Day 1- introducing them to a variety of foods and including them in the cooking process. Recipes include first foods like baby purees and teething cookies, then moves on to include all meals of the day. My kiddo has tagged a bunch of recipes for us to try, including: Blueberry- Lemon Whole Wheat Pancakes, Oatmeal On-the-Go Bars, Pumpkin Waffles, Apple- Cinnamon Sticks, Strawberry Fruit Leather, Un-Fried Chicken Tenders, Baked Shells, Mexican Lasagna, Raspberry Cream Cheese Tarts, Banana Bread Cake and Banana-Oat Chocolate Chip Cookies. 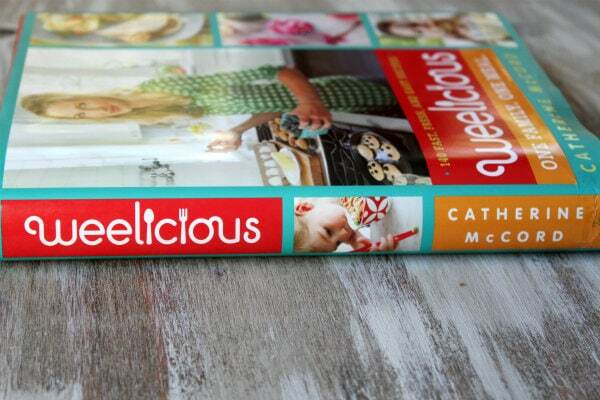 Everything looks so good, and this is such a perfect cookbook for families to have at hand. I wholeheartedly recommend it! 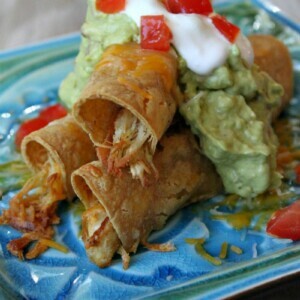 These taquitos are a MAJOR MAJOR MAJOR hit with my family. So good. 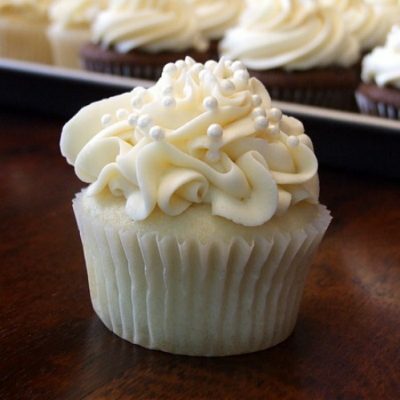 This recipe is a frequent repeater in the Recipe Girl house. And I love that they are baked– and not deep fried!! Thanks, Catherine- for a great, family-friendly recipe! Perfect, family friendly dinner recipe! Preheat the oven to 400 degrees F. Line a baking sheet with foil and spray with nonstick spray. Combine the chicken in a bowl with the cumin, salt and garlic powder- mix in the cheese. Place 2 corn tortillas at a time in between two damp paper towels and microwave for 20 to 30 seconds to soften them (helps to prevent cracking when rolling). With 1 tortilla in front of you, place about 1/4 cup of the chicken mixture in the center of the tortilla and roll it up tightly. Place the taquito seam-side-down on the prepared baking sheet. Repeat with the rest of the tortillas and filling. Spray the tops lightly with cooking spray, and bake for 22 to 25 minutes, or until crisp. Serve with guacamole/sour cream/ salsa, as desired. Note: toppings are not included in nutritional information. Purchase a chicken already roasted from the market- or make your own- place 1 pound boneless skinless chicken breasts in a steamer pot over boiling water and steam for 10 to 15 minutes, until cooked through. Cool slightly and then use a fork to shred it apart. To make easy guacamole for dipping: Mash 1 large avocado with 2 tablespoons sour cream, 1 spoonful of salsa, 1 teaspoon freshly squeezed lime juice and salt and pepper, to taste. 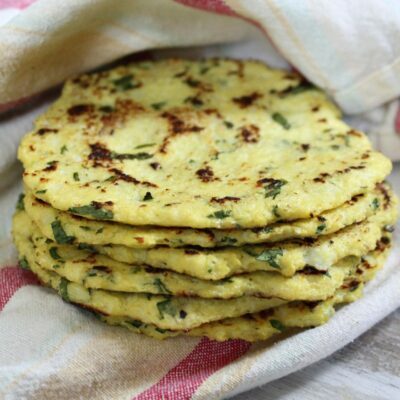 *If you are preparing this recipe as gluten-free, just be sure to use a brand of corn tortillas that is known to be GF (and it's probably safest if you cook and shred your own chicken). Freezing instructions: After step 4, the taquitos can be frozen in freezer zip bags for up to 3 months. I freeze them on the baking sheet, then take them out of the freezer and move them to zip bags. Prepare from step 5 when ready to bake them from the freezer. Taquitos look so good. Can you use cream cheese in the mix? This displaced San Diego girl asked for rolled tacos once and they had no clue what I wanted. Until I can get home for Mexican food I will use your recipe and make my own. 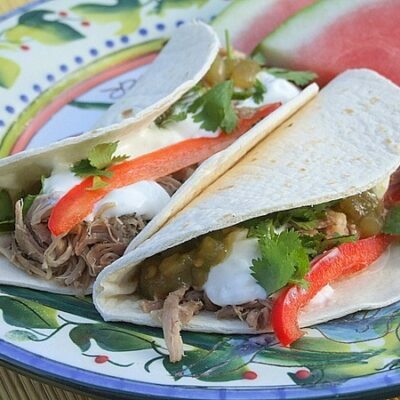 I’m making these tonight using my leftover shredded meat from last night. I made these last night & although mine fell apart in the oven, we called them “broke-itos” & devoured the whole pan 🙂 Great fun, thanks! I made these tonight with a couple of different fillings. They were awesome. And so easy! They got a thumbs-up from every member of the family. Thanks for sharing the recipe. I need to check out the Weelicious cookbook for more! 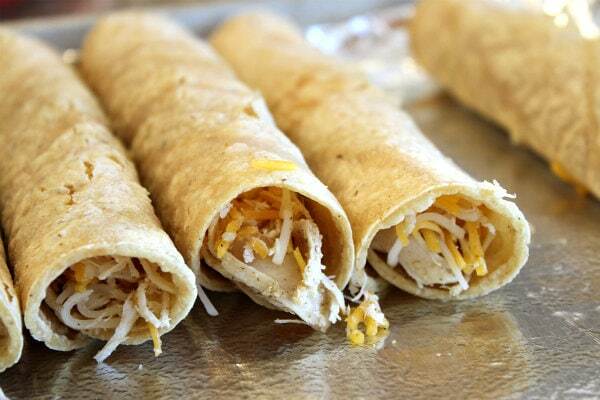 Made these Chicken Taquitos tonight and they were awesome. I used a rotisserie chicken, They were so quick and easy. Will be making these again. Thanks!! I have a whole bunch of corn tortillas that I need to use. 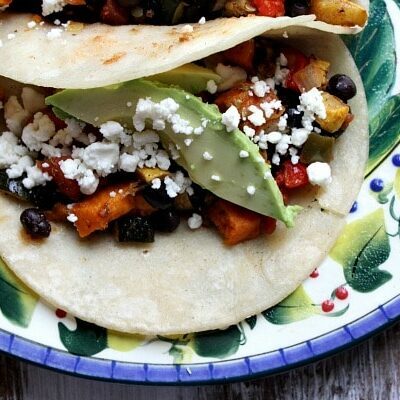 I was thinking about making enchiladas, but these look a whole lot better to me right now. I will try these tomorrow since I know they’re something my kids will love. A perfect use for some left over chicken n a easy lunch. 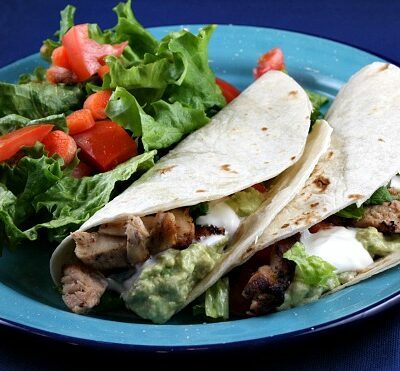 I made these for dinner tonight… prefect for a weeknight mexican meal. I used flour tortillas, and they turned out deliciously crispy. Thanks for another keeper. Made these! Very, very yummy! Tacos are usually a hit in my house! 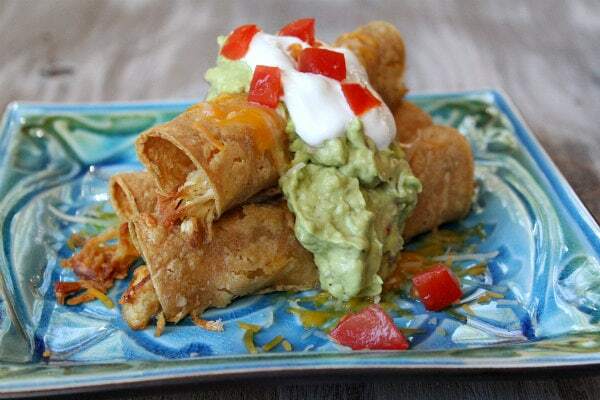 I’m definitely trying these taquitos! They’re a perfect alternative!